After launching on October 5 in Osaka, Japan, the quartet will then head to Fukuoka, Tokyo (for the Loud Park Festival) before continuing on to Hiroshima, Aichi and finally, back to Tokyo for the final show on October 12th. 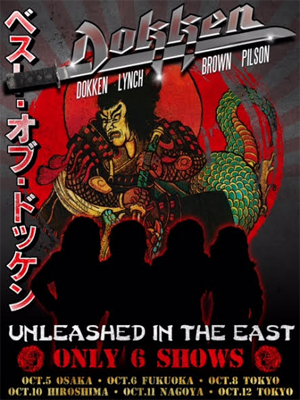 DOKKEN’s Tooth And Nail, released in 1984, contained several hit songs including "Alone Again", "Just Got Lucky" and "Into The Fire", and sold over three million copies worldwide and the band continued releasing many more records with the same success. Tickets for this once in a lifetime event, as well as VIP package experiences, will be on sale beginning August 27th. This will be the one and only opportunity for fans to see the original line-up play their iconic hits.